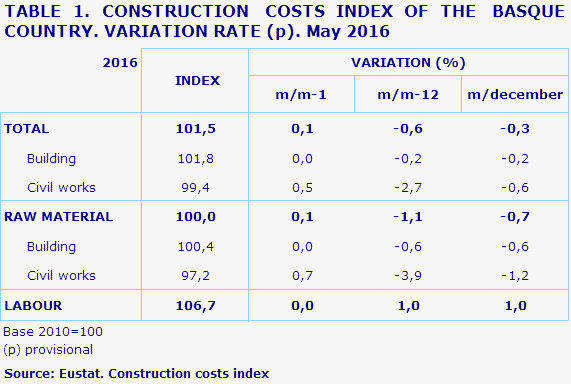 There was a 0.1% rise in Construction Costs in the Basque Country in May 2016 compared to the previous month, whilst the year-on-year rate for the same month fell by 0.6%, according to data provided by EUSTAT. There was no variation in labour costs (0.0%) with regards to the previous month, whereas raw material costs rose by 0.1%. In May, the sub-sectors of Building and Civil Works showed differing trends in the cost of their raw materials in relation to the previous month, with a rise of 0.7% in raw materials, whereas there was no appreciable change in the amount of raw materials consumed by Building (0.0%). The year-on-year performance of both sub-sectors was negative, though to a different degree. Building raw material costs fell by 0.6%, whereas those for Civil Works recorded a 3.9% decrease. The prices of raw materials consumed by the sector that recorded the biggest annual price increases (May 2016 on May 2015) included those in the sectors of the Timber Industry, which was up by 4.2%; Electrical Material, with a rise of 1.8%; and Plastic & Rubber, which rose by 0.5%. Conversely, sectors that saw the biggest price reductions over the last twelve months in raw materials include the sectors of Oil Refining, with a decrease of 24.4%; Metallurgy, which fell by 8.8%; and Electricity & Gas, down by 3.1%.